Yesterday the ever-talented and sweet Lauren Orsini tweeted about a new blog series she was starting called ‘Geek Origin Stories’, where she shared her tales of how she became involved in some of her geeky (and glorious) habits. I told her it was a fantastic idea and she encouraged me to blog about my own experiences, and the first thing that popped into my head was my long history with video games. I will never forget the day when I was a little girl that my mom came home with a shopping bag and zoomed into her bedroom. I followed her, jumping up and down and asking what it was. She said it was a toy for her and my father, and that maybe if I was well-behaved, she would teach me how to use it too. Out of the bag she pulled a Nintendo Entertainment System, complete with the ever-nostalgic Super Mario Brothers/Duck Hunt combo cartridge, and a gray and orange light gun. My world was truly changed forever. This was my first ever experience with video games. I became addicted to the challenge, the music, and the fun graphics on the screen. I began asking my parents for permission to use their Nintendo whenever I was bored, and since I was a rowdy kid and it kept me quiet, my parents were very agreeable to it. When I began to get fussy at my grandparents’ house, they hooked up one of their old game systems for me to play with in their basement. Years later when we moved into their house after my grandfather passed away, I found the box with the system and games in it and was shocked to realize that I had been playing an Intellivision II throughout my childhood! When my aunt and uncle got a Nintendo for my cousins, I spent hours in their basement playing Yoshi’s Cookie, which is still a game I love to play. When my brother was a few years old, he began wanting to play video games too. My parents had bought me a Sega Genesis, which kept me occupied mostly with Disney games and Sonic the Hedgehog, which is still one of my favorite series’ to this day. They thought it smart to get him a different system so we could both share. They got him a Super Nintendo, and I quickly found myself obsessed with it as well, and I wound up playing it far more than my brother did. I began saving up my allowance to go to my local Blockbuster as well to rent games, since it was so much cheaper than buying them. I have so many memories of looking down the aisles like a kid in a candy store, picking games out with my little brother that we would both want to play so that we could share and use that excuse to get our mom to let us get one or two more titles. Those memories are incredibly vivid in my mind even now. I stayed with these systems as I got older, just playing them for fun. It wasn’t until I picked myself up a PlayStation and a copy of Final Fantasy VII that I realized there was so much more out there in the world of video games to explore! My next purchase was Castlevania: Symphony of the Night, and it encouraged me to try all different kinds of games, and when I began to discover things like GamePro Magazine, I realized there was an entire industry behind this stuff, and I started reading magazines and surfing the Internet looking for info on what the hot upcoming titles were. All of this eventually led me to be the video game nut I am today. I always thought of the purchase of my PlayStation as the moment when I became a serious gamer, but looking back now as I write this, I realize that I was just as passionate about video games back then as I am now. Games are simply a lot different now then they were when I was a kid, and a lot of the games I loved back then probably wouldn’t thrill me now, but every time I play a Sonic game, I still have memories of falling into the purple water in the second zone of Sonic 2 and running to hide behind the couch because the sound of the drowning countdown petrified me (I’m fine with it now, before you all start mocking me!). I look back on such memories very fondly. Now I wonder, what drove me to love video games so much? Everyone has different reasons why they take so well to certain hobbies. I think I took to video games because as a child, I had very little friends (the reasons why are plentiful and could fill up several more blog posts, so I will only say that I did not fit in with the children in my town in any way, shape, or form) and when my brother was born, they naturally had to spend a lot of their energy on him, and it was just easier for them to take my little hyperactive ADD-ridden behind and plop me in front of a game system. I began to memorize levels of games like the back of my hand (ADD children happen to have a fantastic memory of the things they actually do pay attention to), and my confidence in being able to beat those games comforted me and let me use that confidence in other areas of my life. So there you have it, some reflection on the origin of my love of video games. I do have a few other Geek Origin stories for you guys, and I can’t wait to share them with you! Many of the most interesting stories in history stem from different myths and legends. Many RPGs have tried to use these same sources to create their stories, and many failed. 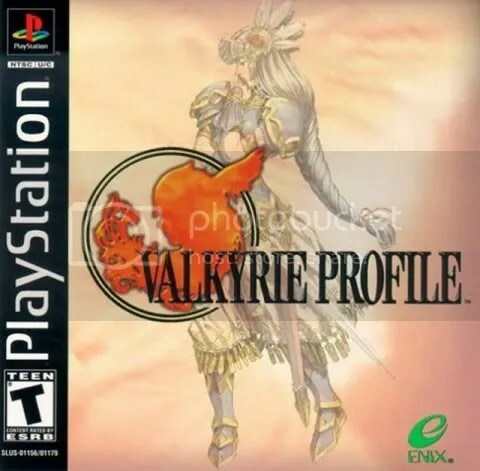 If you’re looking to find a game that did it right however, you need not look any farther than my favorite RPG of all time, Valkyrie Profile. The story is based around Norse mythology, putting you into the role of Lenneth, a Valkyrie who is charged with choosing the strongest souls near death that she can find and sending them up to Asgard to train and fight in the war against the Vanir. Throughout her travels she comes upon a few oddities that make her question her orders. You can either continue to follow orders, or you can pursue the answers to these questions and uncover the truth behind the war and what is really going on in Asgard. The game involves two basic types of gameplay that are broken up into 8 chapters. First, you use your powers of Spiritual Concentration to zone in on these spirits and watch their stories unfold. When you’re not picking up these souls (called Einherjar), you’ll be going into different dungeons, called there by the evil spirits that dwell within. You use these battles to strengthen your Einherjar until they meet the requirements that are given to you at the beginning of that chapter. You can send up one or two Einherjar per chapter, but if they don’t meet the requirements, they may die later on. The battle system is simplistic and downright brilliant. Each character is assigned to one of the famous PlayStation shape button (Square, Triangle, Circle, or X), and hitting the corresponding button makes that character attack. Each character has three possible attacks, and different weapons use one, two, or all of these attacks. You must keep this in mind and use this information to time your attacks so that they fill up the hit gauge in the lower left corner of the screen. Fill it up entirely, and you will be able to unleash a Purify Weird Soul attack, a special super-powered attack that differs from character to character. Making all of these elements work together is essential for dominating your enemies. Dungeons are presented in a 2D platformer style. The monsters are on the screen and you can either strike them to get an advantage or use your power of crystal creation to freeze them and pass them by. You will also use your crystals to create platforms and perform other tricks in order to traverse the sometimes difficult terrains you will face. You will also find massive amounts of treasure, although some chests are booby-trapped with arrows, poison gas, or an ice mist that will freeze you for a short period of time, so its always smart to be careful when plundering! Lenneth and her Einherjar take on any vile creatures that defy the Gods! In addition to leveling up your characters, you also gain Capacity Points (CP) in battle, which are used to level up different abilities that are either inherent to the character or are learned via an item that teaches it. This is a fun way to up your stats and gain new abilities, but once you gain the abilities Guts (which gives you a chance of surviving an attack that would normally kill you) and Auto-Item (which you can set to automatically use Union Plumes to bring you back to life when you do die), it sort of breaks the game and makes it rather difficult for you to perish in battle. Don’t fret if you do die, however; the Guts ability exists for a reason, and that reason is that you are going to die. A lot. It’s par for the course in this game, regardless of the difficulty level you’re playing on. Ah yes, the difficulty levels. You can play on Easy, Normal, or Hard mode. Easy mode is for beginners and only gives you access to the C Ending (where you lose the game) or the B Ending. Normal and Hard modes give you access to the A Ending, which is the best and ‘true’ ending to the game, but these modes are tougher. Hard mode in particular is difficult. In the two easier modes your characters join you at a certain experience level, but all characters start at level 1 in Hard mode. Also, some characters and/or dungeons are only available in Normal and/or Hard modes. Normal is the mode I would suggest; it gives you access to the best ending without making the game frustratingly difficult. The A Ending is also a big problem. It is a fantastic ending and should not be missed, however you really need a walkthrough to get it. Valkyrie has a Seal Rating that goes up or down depending on certain actions you take. In order to get the A Ending, you have to do certain events in a certain order and manipulate things in such a way that you have a certain Seal Rating at a certain point in the game. It is most definitely not something you can stumble upon or figure out by guessing. Once you learn how to do it, however, it isn’t too difficult to achieve and is more than worth the payoff. As far as the graphics are concerned, they are amazing and the backgrounds are breathtaking. Even more incredible is the music, which is absolutely superb. Mixing the audio and visuals with the intense and emotional storyline delivers a completely satisfying and unforgettable package. You will find yourself reluctant to send certain Einherjar to Asgard for sentimental reasons, but you can check on their progress in between chapters, so you can see how they’re doing from time-to-time. Seeing their stories and adventures adds another level of depth to an already beautiful game. If that isn’t enough, beating the game unlocks the Seraphic Gate, a final dungeon independent from the main game that is full of surprises and will truly test your party’s strength. Yes, without a doubt, Valkyrie Profile is my favorite JRPG of all time. It is one of the more rare PlayStation titles out there, but tracking it down is absolutely worth it. If you don’t feel like doing so however, you can just pick up Valkyrie Profile: Lenneth for the PlayStation Portable, which is a direct port of the game with brand-new animated cutscenes that breathe a sweet new life into this game. Either way, this is the one title that I would suggest to every single gamer out there, RPG fan or not. It just might make you a believer! Purchase Valkyrie Profile: Lenneth via this link, and you’ll be supporting Chu*Blog at no additional cost to you! The Shin Megami Tensei series of games are an eclectic group of astoundingly additive and innovative games. With all of its different sub-series’, there are a lot of titles to explore. Out of all them, the one that shines the brightest for me is without a doubt Persona 3 FES. The story of Persona 3 revolves around the Dark Hour, a 25th hour in the day that occurs every night at midnight. Normally people are encased in coffins and have no recollection of this special hour, but some people curiously are awake during it. Lately, monsters called ‘shadows’ have been attacking these people and either killing them or turning them into lifeless husks, a condition that has been dubbed Apathy Syndrome. You start off as the silent protagonist (whom you get to name), a boy who just transferred to Gekkoukan High. You find that you and a select few of your school peers have the ability to experience the Dark Hour. In addition, you and these select classmates all also have the rare ability to summon Personas, creatures that are reflections of your soul that can combat the shadows. You take the chance to join SEES, the group they have put together to fight off the shadows, as you go on a journey to discover why these changes are happening and how to stop more innocent lives from being taken. The Persona series is known for being a marriage of RPG and dating sim elements. Persona 3 brings these two genres together masterfully. Besides the basic RPG elements, you also have to attend school and keep your grades up, as well as juggle your social life. This isn’t all just fun and games however; certain groups or individual people have an Arcana assigned to them (these are called Social Links), and increasing your friendships will empower those Arcana, which will power up Personas that correspond to those Arcana, as well as give any Personas you create of that Aracana an extra boost. 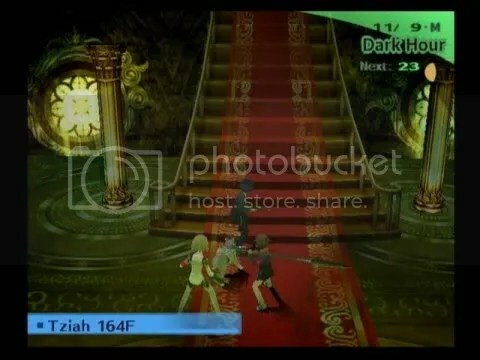 The higher your Social Link is with that Arcana, the more of a boost that Persona gets. To top it off, continuing to spend time with different characters will also let you learn more about them, and just about every character you meet has an interesting story that keeps you emotionally invested and makes you want to keep visiting them. This coupled with the mysterious and addictive main storyline makes for one hell of a tale to tell. You can also visit different places at different times of the day to engage in activities that increase your Academics, Charisma, or Courage. Some Social Links or dialogue options are only available once you hit a certain level in one of these three attributes, so spending time increasing them is important. Some methods will increase these attributes more than others; for instance, spending an afternoon watching romantic French films at the cinema will up your Charisma far more than sipping on a cup of Pheromone Coffee at the mall. Aside from balancing all of this during the day, you have the task of spending the Dark Hour scaling Tartarus, a massive tower full of shadows. The tower is divided into blocks, and each block consists of many floors that are sprinkled with several mini-bosses and one or two big bosses. There are a lot of floors to cover, but each block has a different color scheme and design, and each floor is randomly generated each time you enter it, which helps negative a lot of the repetitive feeling that climbing Tartarus can sometimes give you. Yes, you’re reading that number right. This tower is BIG. Monsters are visible on screen and you can either avoid them or try to hit them first to gain an advantage in battle. 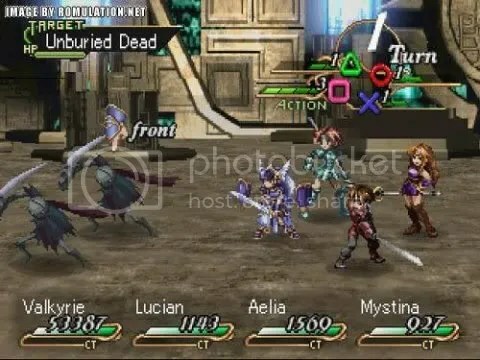 You can also find lots of treasure in Tartarus, and you have the option to explore each floor as a team or to scatter and cover more ground. Since experience is divvied up between everyone who participates in a battle, this allows each character to gain more experience per battle, but they can die if they aren’t strong enough to face a battle alone. Your party members can also become tired, which will greatly reduce their battle performance. When this happens, its best to call it a night and wait until they’re well-rested again before tackling more of Tartarus. Besides weapons, armor, and accessories, you also have the most important element to your battles, which are your Personas. Each character has their own Persona, but the main character has the unique ability to house multiple Personas and can swap them mid-battle. This helps when you discover an enemy’s weakness, as you can change to a Persona that can exploit that weakness, making battles infinitely easier. The only downside is that you cannot control your comrades in battle, and until you find an enemy’s weakness, they may inadvertently use an ability that can heal or be block by an enemy. As for the visuals, they are just about flawless. The game takes place in a 3D plane and is very accurate to what the environments would look like in real life, since the game takes place in modern day Japan. You can run around and use the shoulder buttons to rotate the camera, making moving about very easy. Chatting with other characters is also pleasurable, as many of them have close-up facial art with some pretty hilarious expressions, and talking to many of the important characters comes with the extra joy of top-notch voice acting by some of the most well-known anime and video game voice actors in the industry. The other bundle of ear-pleasing goodies besides the voice acting is the music, which is always fantastic in every Shin Megami Tensei game. The songs range from dark and dangerous to upbeat and almost jazz-like. Each song is positively addictive and you will find yourself singing them in your head over and over again. This is, by far, one of the best video game soundtracks in history. So, while it isn’t a typical JRPG, Persona 3 is still a title that no RPG fan should pass up. The FES (or ‘festival’) edition of the game also comes with new Social Links, new Personas, and 30+ extra hours of gameplay in the form of an after-story known as The Answer. It truly is the ultimate edition of this game, and even more goodness is coming in the form of Persona 3 Portable, which will boast even more new goodies, as well as a female protagonist that comes with a slew of new story events and Social Links. If you haven’t played this game already, now is definitely the time to do it! 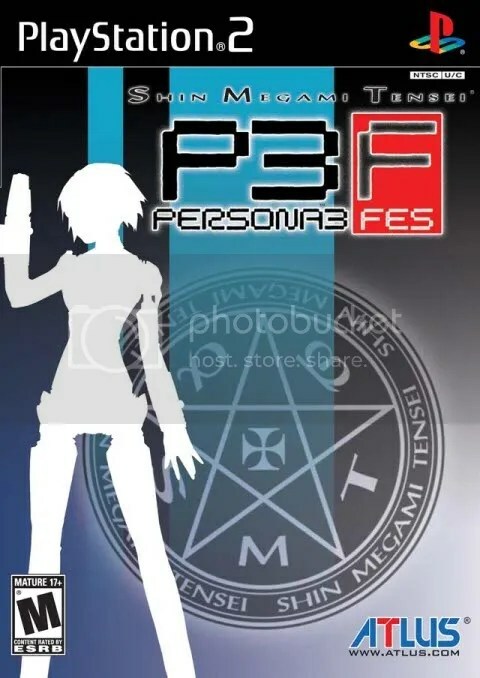 Buy yourself a copy of Shin Megami Tensei: Persona 3 Portable via this link, and you’ll be supporting Chu*Blog at no additional cost to you! Back in the day, it was common to see RPGs on multiple discs when they hit home consoles. Because these games were so expansive, they normally stayed on these consoles and rarely ventured elsewhere. However, Camelot took a chance by creating a truly amazing story, stuffing it gloriously into two Gameboy Advance carts, and calling it Golden Sun. The story starts in a pretty typical fantasy RPG world where people live in peace since the powerful magic known as alchemy has been sealed away. However, two fiends raid the mountain where the four Elemental Stars, which are the cornerstone of alchemical power, are being kept. Their theft shifts the world off-balance. The two culprits, Saturos and Menardi, have the goal of resurrecting alchemy by using each Elemental Star to light its corresponding Elemental Lighthouse. A set of teenagers who live in the town that guards the Stars manage to hold on to one during the attempted theft, and rather than stand idly by, they decide to set out on a journey to stop the lighting of the Elemental Lighthouses and keep alchemy from reawakening. The battle system is pretty typical of RPGs, but it really shines when Djinni are added into the mix. These creatures can be found all around the world and they each possess a set of elemental abilities. You can use the abilities or summon the Djinni in battle. Mix and match different Djinni of different elements and you can summon some powerful creatures to unleash some devastating attacks. All of this is presented in a sort of 2D/3D pivoting battle screen that is unique and visually stunning. Our brave heroes enter into a fight, showing us the unique battle camera angles. Another interesting addition to the battle system is that you can use a cable to connect two Gameboy Advance systems together and fight against a friend’s party, or even just put your warriors into a special area where you can fight some powerful monsters. 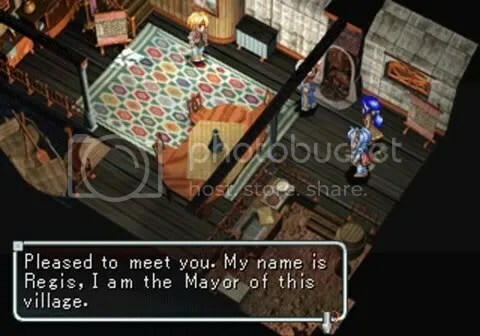 You can also use the cable (or a code that is given to you when you beat the game) to transfer all of your characters stats and belongings to the second game Golden Sun: The Lost Age, so you can continue the adventure without feeling like your hard work was all for nothing. Besides the battles, there are a few other special things about the game. There are many dungeons with an almost endless array of puzzles, putting your creativity to the test as you are forced to use the spells the Djinni offer you to influence your environment in a way that will let you continue on. This can include anything from pushing platforms out of the way (or into a certain spot) to making vines grow that you can use to climb up or down. You will also find special coins that you can use in a specific town to play several mini-games that will earn you everything from money to special items and equipment you can’t get anywhere else. 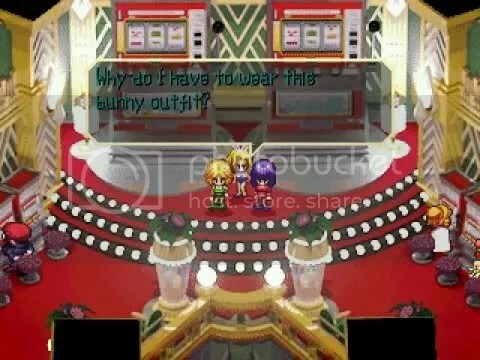 The music in Golden Sun is fun and addictive. You’ll never get tired of hearing the music, and it blends in well with all of the different settings you will come upon in your journeys. The graphics are gorgeous, colored in a way that makes everything stand out. When put together with the unique and enjoyable gameplay, it makes for a portable adventure that feels too big to fit in the palm of your hands. If you haven’t tried out the Golden Sun series yet, now is the time to do it! 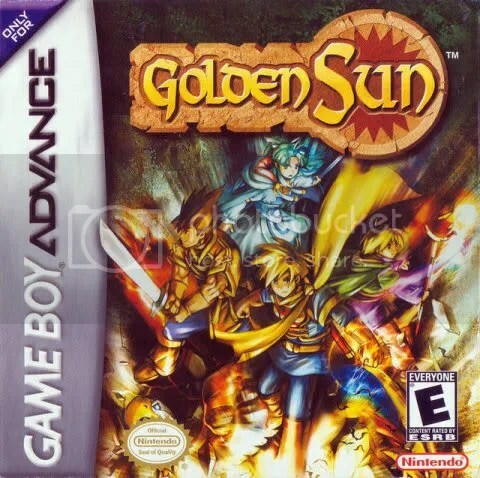 One of the biggest highlights of last year’s E3 was the announcement of the tentatively titled Golden Sun DS, which will be the third and newest addition to this incredible game series. This is one JRPG that is often not given the credit it deserves, and is truly a diamond in the rough. Go dust it off and check it out for yourself! Buy yourself a copy of Golden Sun DS via this link and you’ll be supporting Chu*Blog at no additional cost to you! Yes, you’re probably sick and tired of seeing Final Fantasy VII on lists of great RPGs. There are a plethora of reasons why this game consistently winds up with such high praise, but my reason for putting it on this list is a very personal one. I was in my young teens when I wound up with a bunch of cash given to me by various family members for my birthday. My best friend at the time gave me a suggestion as to what to do with it, and I took her advice. I got my mom to take me to the local Toys ‘R Us and I walked out with a brand-new PlayStation, a huge memory card, and Final Fantasy VII. From that day on, my life as a gamer was forever changed. You see, Final Fantasy VII was the first RPG I ever played. It introduced me to the genre, and it wasn’t until I branched out into other titles that I realized how this game changed everything. Yes, as much as some people may loathe to admit it, no matter how much you love or hate this game, it changed things in the JRPG world forever while still keeping many of the things that make the Final Fantasy series so great. 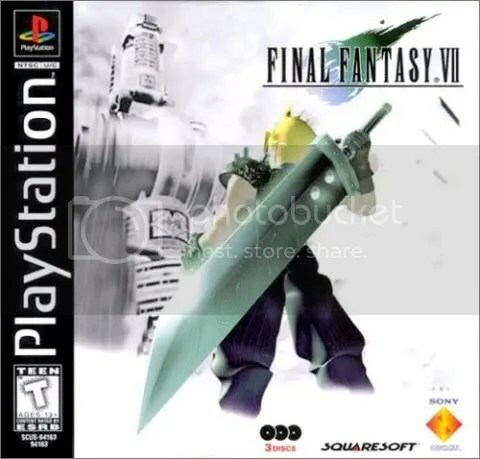 It introduced us to a truly grand storyline, focusing around an ex-soldier named Cloud and his adventures with a group called AVALANCHE who are trying to save the planet by stopping the evil Shinra company from harvesting mako, a mysterious substance that is the lifeblood of the planet. The deeper he delves into Shinra’s dealings, the more he starts to experience strange spells of dizziness and voices in his head, and he begins to find out truths behind his past and the most secret inner-workings of Shinra that will result in a battle to save the world. The characters are memorable and each had a deep story that made you feel truly attached to them. The story started off slow at first, but as things progressed and pasts were revealed, it became an incredible weaving of storylines that sticks with those who experienced it to this very day. The story is so powerful that it has spawned several spin-off games and even a wildly popular movie that continued these tales. There is one bone I have to pick with the story however, and it lies in the localization. When Final Fantasy VII was brought over to America and was being localized, the Squaresoft team ran out of time and left a few events unfinished (I would go into greater detail, but to do so would give some huge spoilers!). Also, there are a few problems with the dialogue translations, such as Aeris happening upon an ill man and commenting that “this guy are sick”. There are very few of these hiccups in the translation, but you would think that they would have paid closer attention to such things when dealing with such a highly anticipated game. Just looking at this scene brings back so many memories that are dear to me! The graphics were a foray into 3D polygonal technology, and while it was awe-inspiring at the time, it did not age well. However, it only serves to give a feeling of nostalgia. The character designs were also a big departure from anything we had seen from RPGs before, save for a few titles that had an anime style to them such as Chrono Trigger. Of course, the gameplay was also revolutionary. You could buy weapons, armor, and accessories, but the big draw was materia, spheres of energy that you could equip to your battle gear that not only gave you special abilities, but altered your stats as well. Even the materia had levels, and leveling them up would give you new abilities until the materia’s level was maxed out, at which point it spawned a new copy of itself. You could level up the new one and sell the mastered materia for major cash, or just hang on to your powerful spells for the long haul. Also, each weapon and piece of armor had different configurations of materia slots, and planning both your gear layout and your set of abilities together was vital. The big issue with this however is that the game gives you the ability to transfer one character’s set of materia to another. 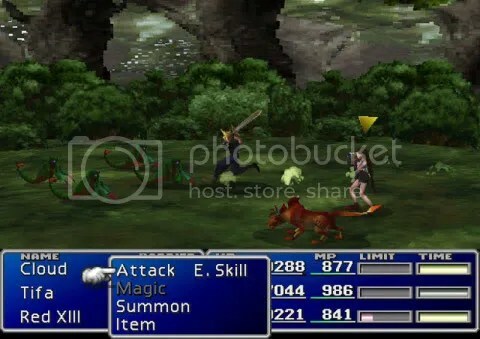 You can easily fall prey to the desire to skip the tedium of re-equipping materia each time you switch characters in and out of your party, but copy-pasting your materia layout quickly results in the characters becoming battle-clones of each other, giving very little diversity to the characters when in a fight, save for their special attacks, called Limit Breaks. There were also hidden characters and a slew of side-quests to explore, the most memorable of which was the glorious conglomerate of mini-games and gambling known as the Gold Saucer. Not only could you relax and play the games found in the Gold Saucer, but you could enter the battle arena to level up and earn special items and weapons. If you captured some chocobos during your travels, you could race them here to strengthen them up so they were prime for breeding, all in the name of acquiring the gold chocobo, which would allow you access to some special places that you couldn’t get to anywhere else. All of the amazing points of this game, however, are pushed aside when you discuss the music. Nobuo Uematsu is known for his incredible music, and he certainly does not falter with Final Fantasy VII. The soundtrack spans several discs and is filled with fun and quirky songs, powerful and energetic riffs, and sad and emotional pieces. Listening to these songs even long after you have played the game serves to bring back memories that will make you want to pick up your PlayStation controller all over again. Yes, Final Fantasy VII is overrated. Despite how much I clearly love this game, there is no doubting that the game is over-hyped, and many people who have yet to play it and pick it up will probably tend to be disappointed when they compare the reality to what they’ve heard. However, it’s important to remember that overrated does not always equal bad. Although it may not live up to much of the hype, Final Fantasy VII is still an incredible game and an absolute gem of the JRPG genre. It is a title that no RPG fan should miss, and one that still stands the test of time as one of the most memorable titles to ever come out of the genre. You can play Final Fantasy VII by tracking down a copy for the PlayStation or by downloading it onto your Playstation 3 or Playstation Portable! If you thought a RPG with two playable characters sounded great, how does seven sound? I can promise you, the reality is far better than what you’re imagining! SaGa Frontier‘s plot is hard to explain, because each of the seven characters have their own stories that take place in the same world. Many of the events are the same however, giving you different perspectives on different occurrences. This may sound repetitive, but the stories for each character differ greatly, varying from a woman on a path of revenge, to a man’s quest for ultimate power, to the tale of a robot simply trying to find its way in the world. This game also boasts the Free Scenario System, which lets you complete the events of the story in any order you wish, sometimes even intersecting with other characters’ stories. Some characters can even recruit other main characters for their own adventures! If this isn’t enough reason for you to try each story, finishing all seven characters’ adventures will earn you a very special ending! Another great thing about this game is how customizable your characters are. There are several kinds of magic in this game, some are represented by tarot arcana, others represented by runes. You can choose one or the other, then go out on quests to earn the right to those magics. Some magics cannot be wielded by the same character (for instance, a character cannot have both light and shadow magic at the same time), so it is important to plan how you want to configure your characters based on their natural strengths and weaknesses. If you work hard enough, you can even uncover some devastating combo attacks when you have the right mix of abilities at your disposal. This calls for quite a bit of tactical thinking, but its never boring and always fun. Even outfitting your characters is a treat. You can earn money in battles or by gold bricks via buying low and selling high, earning you major cash. It takes a bit of footwork, but its worth it when you get to go to junkyards and other shops to outfit your characters with some powerful and downright crazy weapons and armor. Combining strong weapons and armor with potent magics is the key to being successful in your travels. The music is very powerful in this game as well. The sounds are nostalgic and downright epic. The soundtrack boasts over 70 tracks and was originally released in a 3-disc set, so there is also a wide variety of music that will ensure you never get tired of the beautiful sounds coming from your speakers. Much of the reason for the variety of music is because of the different settings, which range from medieval castles to cyberspace-like worlds, ensuring that fans of all RPG genres will have something to love here. Unfortunately, the graphics are where this game falls short. The game attempts to present 3D-looking objects on a 2D plane, and it doesn’t work out well, especially in battle. It results in some of the scenes and bosses looking almost cheesy, but you will barely notice it once you get pulled into the gameplay and get sucked into the highly addicting world presented to you. For me at least, it gives me a nostalgic feeling and reminds me of when games were just emerging into the world of 3D graphics and really beginning to grow visually. 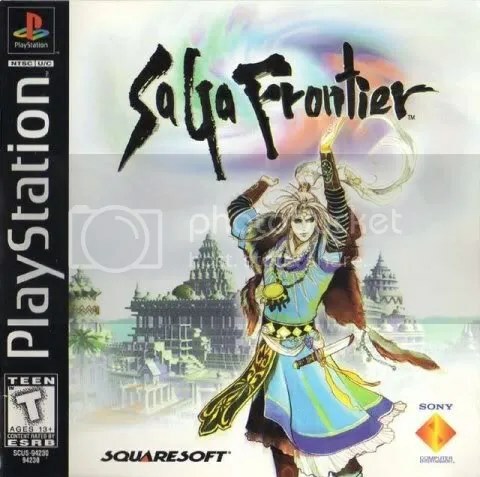 If you haven’t tried it yet, SaGa Frontier is one title not to be missed. The numerous amounts of main stories and side-stories, side-quests, items, weapons, armors, and spells make the game almost infinite in its progression, ensuring that no two play attempts will ever truly be the same. The recurrence of memorable bosses and side-characters also add a ton of charm to this gem of a game, a charm that all gamers should give in to and give a spin. I was wide-eyed and in awe when the world of JRPGs was opened to me. Everything about the genre was new and breathtaking. So, you could imagine my excitement when I found an RPG with two playable characters and over 80 different endings! When I picked the game up for myself, I was certainly not disappointed. 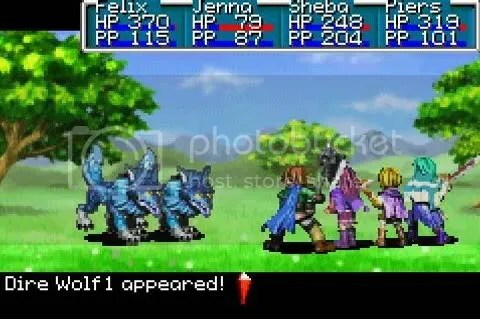 The world of Expel where Star Ocean: The Second Story begins was rather peaceful, until monsters started popping up everywhere! You can take the reigns of this adventure as Rena, a young girl from Expel who is beginning to grow into her own and learn the secrets of her past, or as Claude, a space Ensign who accidentally winds up on Expel. The technology he wields, which is far that above Expel’s, is mistaken for mystical powers, leading the people of Expel to believe Claude is a warrior prophesied to come and save them. He and Rena wind up on a quest to save the planet (and maybe even all of existence!) from destruction, while picking up some memorable friends along the way. Nowadays the idea of having two playable characters in an RPG isn’t that revolutionary, but this game does it so right. There are certain characters, dialogue options, scenes, and endings you can only get by playing as either Rena or Claude, meaning you will have to play through at least once as each of them to experience the bulk of the game. There are also a plethora of side-quests that can inspire a character to join or party or earn you some sweet loot. Sometimes when you try to enter or exit a town a certain points in the game, you will be alerted of available ‘Private Actions’, which are special little scenes that can bring you closer to (or further apart from) the other person involved depending on how you handle yourself. These choices will effect the endings you get. Oh, yes, the endings. The reason why the game claims there are over 80 different endings is because, depending on your actions and dialogue choices, the end of the game can result in certain characters being best friends (or lovers) with each other, with each situation giving you a different scene at the end. You can get a bit of a feel for what endings you’re on the way to receiving by paying attention in-battle. When a character is seriously injured or knocked out and a person who cares deeply for them is in the battle party, you may see them scream their name in horror and go berserk on the enemy. This kind of customization flows through the gameplay as well. Claude meets the mayor of Rena’s hometown, who believes Claude is the Warrior of Light that legends have spoken of. As far as battles go, this game is a pretty standard RPG, but outside of battle is where it shines. You can buy skills and then level them up, allowing you to create items, make money, or even raise stats. These abilities range from creating music to learning alchemy to cooking. The cooking in particular was always my favorite, so allow me to elaborate on it a bit to give you an idea of how in-depth this game goes. You go to markets and buy foods and/or recipes, then put the food together and see what happens. Depending on the combination of foods and your skill level in cooking, you can create culinary heaven or complete disaster, both of which can have a corresponding effect on whomever you feed it to. Each character also has a favorite food which will give them a little special boost when they eat it. You can even create alcoholic beverages, but only the characters over the age of 18 can brew them up! Just about every creation-based skill is this detailed, and experimenting with the different skills is a total blast. The graphics are very nice for its time, and the world map has a sort of 3D feel to it that is pretty fun to navigate. Even the locations you enter have an interesting 2D/3D effect where you can see your character run behind buildings or disappear as they run up and down hills in the distance (this is fairly common now, but was certainly not for its time). The characters also have many hilarious facial expressions to see. The music is also very fun and memorable, and listening to it always stirs up emotions and memories in me, reminding me of how much I loved this game. So, there you have it! 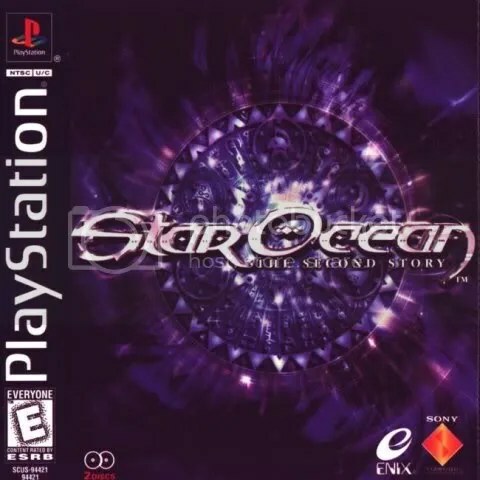 Star Ocean: The Second Story is a wonderful classic RPG that delivers both in visuals and gameplay. If you can manage it, pick it up and experience it for yourself! Even those RPG fans who dislike or are tired of the ‘classic’ RPG feel will find this title refreshing and fun to play. You can purchase Star Ocean: Second Evolution , the PlayStation Portable enhanced remake of Star Ocean: The Second Story for yourself! Purchasing it via this link will help support Chu*Blog at no extra cost to you!